Hello hello! Kelly O. here, with a ton of exciting community stuff to share with you this month! There’s a lot to cover, so I’ll cut right to the chase! First, we’re coming up on the Portland conference here in just four weeks (!? ), and we’re starting to get pretty stoked. Tickets are fully sold out, but if you’re itching for a conference fix, now’s a great time to look ahead to Prague in September… especially if you’d like to speak! The Prague call for proposals is open until midnight, Tuesday May 15th, and you can read more and submit your talk idea here on our CFP page. 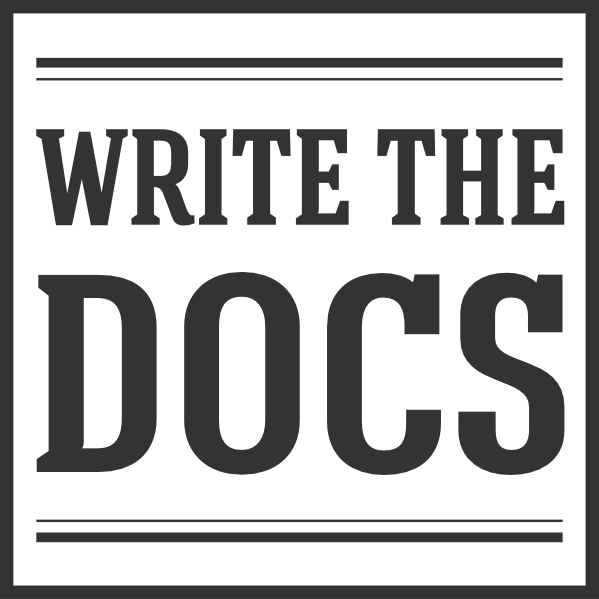 We also have a new virtual resource to announce – the Write the Docs Video Archive! You can now easily browse all of the videos from every North American and European conference, going back over the last three years. There are hours of excellent talks in there, on almost any docs-topic you can think of. Dive in! In addition to all that, we had a handful of intriguing discussions crop up across Slack this month. Read on for those, as well as some featured listings from the Job Board, news about upcoming community meetups, and a discount link for anyone interested in attending the Support Driven Expo this June! A question came up this month about the best approach for hosting the different parts of a public SDK – docs, examples, reference apps, and more. The heart of the original poster’s question had to do with evolving their documentation approach as the product matured. Developers began to contribute samples and reference apps, and it started to become apparent that the developer resources might need their own home and processes separate from the user and admin content. A plan for how developers will be able to update and maintain their samples from release to release. Options for auto-generating reference documentation for the APIs, if possible. And if auto-generation isn’t an option, a way to communicate changes in the APIs to developers so they can document them. Turns out this is a situation that lots of others had dealt with, and the consensus was strong: testing is key. If you want to maintain up-to-date samples, it’s well worth putting in the time to build some kind of testing that runs the latest version of the product and compares the relevant areas of code to the samples in your documentation. Granted, these tests can be difficult to implement, especially if you’re working with pre-existing, manually generated content, but even small steps are steps in the right direction. Avoid leaving cells blank unless the data for the cell is actually missing. Blank cells often indicate missing data. When you use a placeholder or no-value indicator, use a different alignment than you used for cells with values. If, however, you want to specifically draw attention cells that have no value, leaving them blank can be a good way to get them to stand out in larger tables. As always, context is key. Consider your audience and publishing format when determining the formatting fate of your empty cells. Got a finicky formatting or mechanics question? The friendly folks in #general can help you answer it. Have another docs tool to share or chat about? #doctools is the place for you. The topic of job titles is a perennial one on the Write the Docs Slack. In this month’s iteration, there were some interesting reflections about how your title can impact the way your team thinks about your role. For many of us, our contributions do not start and end with writing documentation. We often work closely with product teams to contribute to the information architecture, content design, and product copy that shapes our users’ experience. In order to center those contributions, some folks have been shifting their job titles away from the more traditional ‘Tech Writer’ or ‘Technical Author’ and towards things like ‘Product Content Strategist’, ‘UX/UI Writer’, or ‘Content Designer’. Adopting titles like this can help clarify the way you work, the range of your expertise, and at what point in the cycle you should be involved (hint: from the beginning). Even if you’re not job-hunting at present, it might be worth revisiting your title in your current position to see if it can do more to reflect the realities of your role. Itching to jump in on the ever-evolving job titles discussion? Join in at #career-advice. To apply for these jobs or to post a listing, visit the Write the Docs Job Board. If you’re looking for another docs-adjacent conference adventure this summer, check out Support Driven Expo, happening June 21-22 in Portland. Some highlights include a docs talk by Emily Richardson from MailChimp, an ally skills workshop by Meg Brennan and Trisha Todman from Airbnb, and a workshop on negotiating by Diana Potter from Qwilr. Use this link by April 30th to get $75 off tickets! And if you need a community fix in the meantime, we’ve got a good handful of meetups coming up, as well!